American Bittersweet. Celastrus scandens L.
False bittersweet, climbing bittersweet, shrubby bittersweet, fevertwig, fever-twitch, staff tree, climbing staff tree, staff vine, waxwork, Roxbury waxwork, yellowroot, climbing orange-root, Jacob's-ladder. This woody vine or climbing shrub is found in woods and thickets, growing in rich damp soil from Ontario to Manitoba and south to North Carolina and New Mexico. American bittersweet is a woody and shrubby climber, growing over trees or fences. It has smooth thin leaves 2 to 4 inches long and about half as wide. The small greenish-white or greenish-yellow flowers are produced in June in short clusters. The fruit is a roundish, orange-yellow capsule which opens in autumn, disclosing the scarlet-colored seed. The seed capsules remain on the plant well into the cold season. The bark of the plant and root, but especially that of the root. prev: Aletris. Aletris farinosa L.
next: American Cranberrybush. 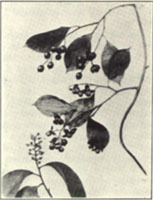 Viburnum trilobum Marsh.